campcamp | I'm going to Burning Man. 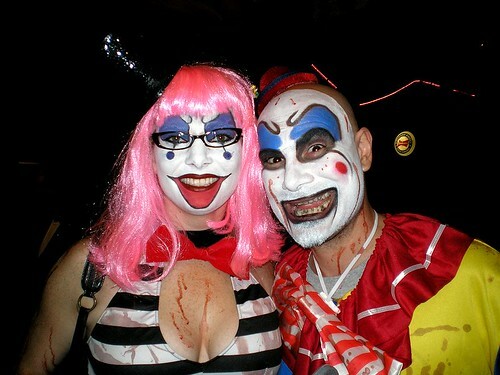 CarnEvil pics from Gizmo (CampCamper)! I enjoyed harrassing the Lamplights, as they lit the end of the path, there. “Ooooh, yeah, just like that…easy…easy…don’t drop it! Yeah…there you go (as they slid it onto the pole)…” Etc. DOOM was up in those woods, there, behind the couch. The couch was perfect for watching Dale Jr. on the TV we had – yes, it worked. Hilarious. People were like, “You should have emptied it out and used it as a frame or something…” Yeah. No. TV in the woods was much funnier. You can also see, there on the right, the hunting blind. Now, see it in action! I couldn’t beg people to sign up for CampCamp! this year. I think Transformus will be a very different story! I think I have an art project. I think this year I will try to invest in a projector of some sort. I so do love film, the cinema, movies, la la la, and projecting Haxan into the woods would be so fantastic…. Maybe, first, I should clean my house. Make sure the floor is still there under piles of fabric scraps and laundry and to-do lists.